Golfers are always looking to improve their game. New clubs, new gloves, and anything else to give them an edge. While the success you have on the course heavily depends on how well you ​get your ​distances. ​It will not only help you swing confidently but also will give you a feeling of satisfaction ​during your rounds. ​It is an essential product for any serious golfer who wants to hit the target accurately​. ​​Be prepared ​to get ​​embarrassed ​in front of your buddies if you don't possess a rangefinder and they do. Because they have a very high chance of ​taking accurate shots and surely will make an informed decision against a player who doesn't have the device. Are you sure you are willing to take that risk and giving your ​competitor an unfair advantage in the course? ​Our guess is that you are certainly not ​willing to fall in that type of situation! ​So, we ​thought of presenting a guide to our readers about golf rangefinder review ​to help selecting a better device. ​Hopefully, ​it will help ​in your decision at choosing and buying a rangefinder. ​Let's get started and ​see what are some of the best golf rangefinder of 2019 in the market at present. Please Note: As you may know, United States Golf Association do not allow ​devices that measure wind speed and slope. So accordingly, we have ​listed ​most rangefinder that don't measure speed and have the ​option to turn off slope feature to make it tournament legal. It is done because, this article is mainly catered towards golf players. ​TecTecTec is a company that specialises in creating optics like golf rangefinders. They create high-quality but affordable rangefinders for rookies and pros alike. 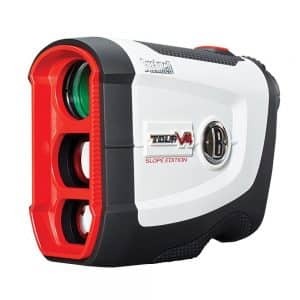 The TecTecTec VPRO500S Slope Golf Rangefinder is one of their highest-selling best golf laser rangefinder. It comes in a very stylish shiny black finish along with a variety of extras to make it an even better deal. We chose this model because it shares many of the deluxe features that the higher-priced models have. However, it has a much shorter effective range than the other higher end models, making your choice ultimately come down to the distances you’re regularly measuring. If the hole is too long, you can’t find the flag. 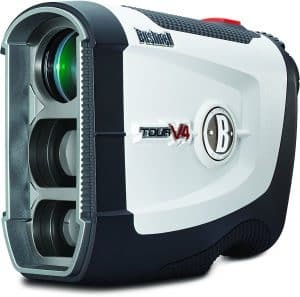 The TecTecTec VPRO500S Slope Golf Rangefinder is a great addition to any golfer’s arsenal. This laser rangefinder has an effective range of 540 yards, which covers the majority of courses you will come up against. All you have to do is point it at the target, and pull the trigger. If your target is too far to see easily, you can use the 6x magnification to get a better look. Once you track the pin-down, the PinSensor technology will lock on so that you don’t accidentally measure the woods behind the green. With the slope function on, you’ll even receive adjusted distances so you know what the shot will play like, rather than just the distance to it. This is amazing for rough terrain and can be the difference between a birdie and par. The VPRO500S is also very accurate, with it being within 1 yard of perfectly accurate for its entire effective range. It also comes equipped with a trendy and stylish carrying pouch that contains a variety of extras like a complimentary CR2 battery, wrist strap, microfiber cleaning cloth, and a regular manual guide so you don’t hold up the game. Along with being stylish in black and yellow, the case is also quite sturdy. Being shock resistant allows the case to shelter your range finder from any incoming impact from falls or even from poor weather conditions. However, the case may be weather resistant, but that doesn’t help you when you’re out using it. Fortunately, the rangefinder is made with rainproof materials so that you don’t have to worry about it raining on your parade. 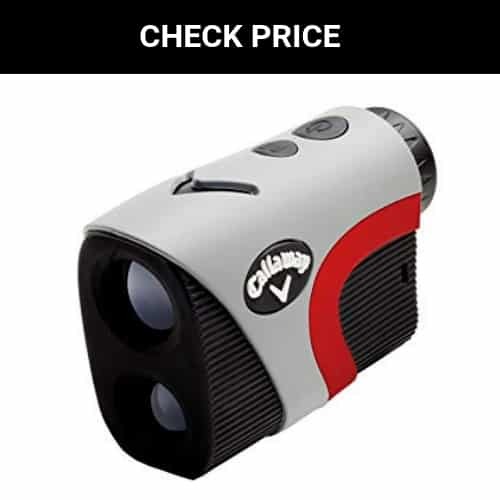 Another great feature of this model of rangefinder is the price, it’s not listed as one of our budget options, but as we mentioned above, it is actually similar to the high-priced models in efficiency and cheaper than comparable models of its own ability. Along with all these wonderful features, when purchasing this unit, you will also get a 30-day warranty to return it for any reason and on top of that a two-year limited warranty which will protect you from defects or natural damage. For its price, this model is one of the better performing options of the list. However, it does have some shortcomings. As you will see later on, the 540-yard effective range is dwarfed by some slightly higher priced products. Depending on where you play, this may or may not hinder you. This model also cannot measure speed and requires you to install batteries rather than being rechargeable. ​Yes, you can use it and works fine. ​What is the color of the display? ​Can I turned off the slope feature? ​Yes, you can easily turn off the slope option​ with this new ​model. ​​What is the warranty period? ​​It comes with 2 years ​manufacturer warranty. ​When reading slope can I switch between yards and meters? ​Yes, there is an option where you can switch between yards and meters. ​Does the slope works with any target or it just only work when pointing to the flag? ​The slope ​measure works with any pointed target. ​Is​ the product comes with a case? ​Yes, it comes with a unique case provided by the manufacturer. ​Who is the manufacturer of the product? ​The name of the manufacturer is TecTecTec officially established in the year 2014. ​What is the size and weight of the product? ​4.1x2.8x1.6 inches and ​12 ounces. ​Are the batteries included with the device? ​Does it have automatic shut off feature to reserve battery? ​Yes, this product automatically shut off to conserve the battery. ​The body of this product is rainproof. ​How much time do a fully charged battery last on this device? ​It totally depends in the usage of the product. But, generally it last approximately 50 rounds. You can’t really go wrong with the TecTecTec VPRO500S Slope Golf Rangefinder. It comes with many deluxe features without the high-end price. With the primary negative being the short range, those who frequent shorter courses would likely have a better time with this rangefinder than others. However, many courses are less than 540 yards, so it’s an option to consider. If you couldn’t tell by the name, Precision Pro Golf is a company that specialises in creating golf rangefinders. The NX7 Rangefinder is their most premium product offered. It comes in a cool black and green design with hex-texturing on the outside for grip. We chose this model because like the VPRO500S, it has many exclusive features without quite reaching the high price range. However, its primary limitation is a very short effective range, making it a niche choice for smaller courses. 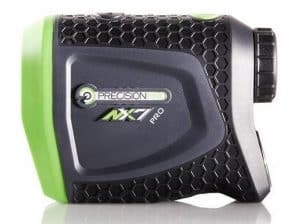 The NX7 model from Precision Pro Golf is a laser rangefinder with many outstanding features. Its effective range is only 400 yards. However, it is accurate ± 1 yard. It includes adaptive slope support, which accounts for the incline or decline of your target and tells you how to play it. This feature can be disabled to make it USGA-legal for tournaments. It also has pulse vibration to let you know when you’re correctly lined up with the TAG system, and a 6x zoom to find your target from far away. This way you don’t lock onto the wrong thing and over or undershoot your target. Similar to the VPRO500S, this model struggles with its effective range. At only 400 yards, the range is less than some par 5’s you will find on larger golf courses, making it hard for you to get the most out of your product. The price is also a concern because relative to other options, this model has a much less effective range but is similarly priced to them. In this context, we have to consider ​that the NX7 has a premium build quality than ​other models listed in the article. You can feel it when you will get the product and hold it in your hand. ​Non rechargeable battery and ​lack of calculating speed is another drawback of this model. But, as we have already said in the beginning that we are mostly choosing rangefinders that are suitable for ​golf tournaments. So, inability to calculate wind speed will be found in most of our selected golf rangefinder list. ​The product is not water proof but it is build to easily tackle any wet and rainy conditions. ​What is the shock proof design all about? It helps to resist the device any ​drops, tosses or any other impact in golf courses. ​What type of battery is used in the device? ​It can be run with CR2 3 volt battery. What's included in the box from manufacturer? ​When you purchase a new NX7 Pro, it comes with the device, a hard carrying solid ​case, 3 volt battery, manual guide, a cleaning cloth and a lanyard. ​This product is likely for those who will benefit from the care package they offer, including the free services. This product is very user-friendly, making it a decent option for beginners who are looking to spend a bit more than a budget rangefinder would cost. However, we would recommend that you survey all the options to find out what other choices you have. ​If you’re reading this, you probably know who Callaway are. They are one of the bigger golf manufacturers in the world, with an array of balls, clubs, and rangefinders. 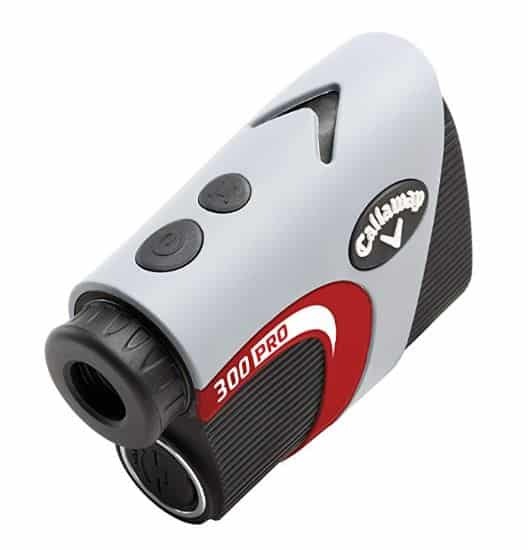 The Callaway 300 Pro Laser Rangefinder is their highest-rated product, and for a good reason. 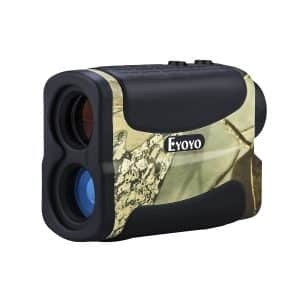 We chose this model because it offers nearly double the effective ranges as the first two slope rangefinders without too much of a price jump. It also contains a variety of features that let it compete with the higher-priced options, and is one of the smallest and more portable options available at just 4.25” by 3” by 1.75”. 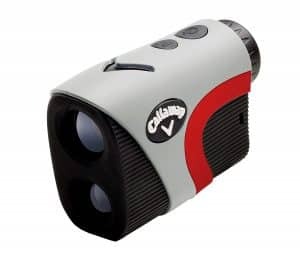 The Callaway 300 Pro Laser Rangefinder is a waterproof and compact laser-powered rangefinder with an effective range of up to 1,000 yards and an accuracy of ± 1 yard. This way you can be confident in your club choice no matter how long the hole is. It also has a scan feature that marks multiple features like boundaries as well as the pin. When you do target the pin, the pin acquisition technology (PAT) system locks onto it for more accurate measurements, and chirps when you lock on. If the pin is too far to see, you can use the 6x magnification to track it down. Once you do, keep an eye out for the toggleable slope function that gives you an adjusted distance based on the incline or decline of the ground. It also comes with a carrying case to make it more convenient to bring with you. However, this model is so compact you could probably fit it in your pocket. Though this model doesn’t have sufficient range problems, it still isn’t able to measure speeds and uses CR-2 batteries, making it inconvenient to power. However, there is not much else that is negative as it ​almost the same price-range of NX7 Pro with a higher effective range, and only slightly more expensive than the VPRO500S. ​​Can I turned off the slope feature? ​​Yes, ​with a click of a button you can easily turn off this feature. ​PAT stands for Pin Acquisition Technology which can lock on the pin upto 300 yards away. ​What is exclusive ​BIRDIE feature? With this feature the device made a "chirp" audible sound ​to confirm distance acquisition to flagstick. Also, if you do not want this feature, you can easily turn off. ​Yes, according to manufacturer it is water and fog proof. ​What battery can be use in the device? ​It works only with a CR2 battery. ​Does it comes with a case? ​Yes, it comes with a heavy cloth type case. Please refer to the photo below. ​​At the listed price, the Callaway 300 is an excellent middle-tier option for anyone who wants a good array of features without spending too much money. It is likely too expensive for a beginner who cannot take advantage of all the features it offers. It has comparable features to $300+ rangefinders for a minimum of 25% cheaper, making it an excellent choice for anyone who is happy with great but not exceptional range and accuracy. We think it is a best golf rangefinder for ​your money. So, we rated it a 5 star by ​looking into many factors. Eyoyo is an optics company that create rangefinders for hunters and golfers alike. The Eyoyo 5-700 Yard Rangefinder is a combination for these two sports, with multiple functions so that it can be used for either. This rangefinder is the least expensive of the list, but still has some useful features for golfers. At this price range, you have to consider it. 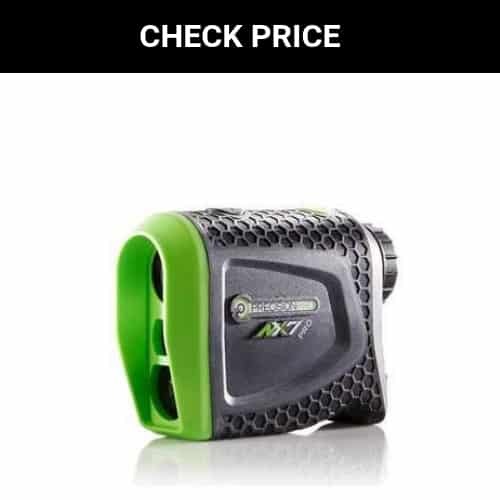 We chose this model because it is truly affordable, ​beginner friendly and best cheap golf rangefinder ​in the market right now. The Eyoyo 5-700 Yard Rangefinder is a laser-powered rangefinder with a respectable effective range of 700 yards, with a margin of error of no more than ±1 yard. Precision is incredibly important in both sports, and the accuracy at the effective range allows you to be confident in your shot, regardless of if it is at a hole or game. The device also has a 6x magnification which will allow you to see the hole (or a deer) as well as a scanning system to mark hazards. The flagpole lock feature will lock onto the pole when you target it, giving you a precise measurement. While it is more useful for hunting, the rangefinder is also one of the few on this list that can measure speed up to 300 km/hr., within 5 km/hr. of accuracy. 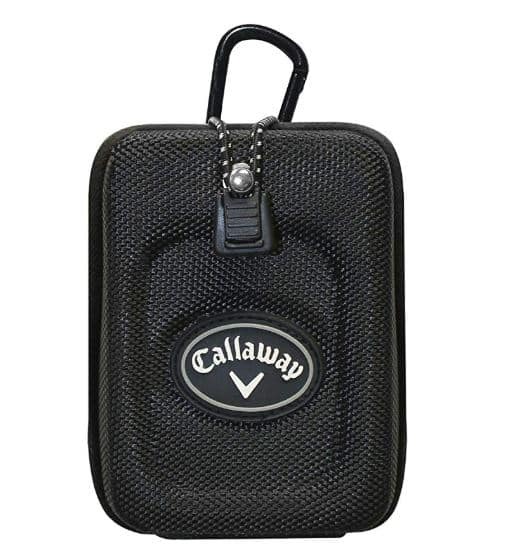 Lastly, it comes with an assortment of extras, including a premium carrying pouch that hooks to your golf bag and cushions it from impacts and the weather as well as a cleaning cloth, extra battery, and an 18-month warranty. Naturally, the budget option is going to have some negatives about it. This product could be exceptionally improved if it had a slope compensation feature. At this price point and with its effective range, it would be by far the best value available. As with many other rangefinders, the Eyoyo 5-700 Yard Rangefinder also needs CR-2 batteries for power. ​​Despite not having an essential feature like slope support, this is still an excellent multi-use rangefinder for beginners. The price point is great for trying out your first rangefinder, and the features are pretty impressive for being so much cheaper than almost every other option. If you don’t care about measuring slope, you can’t go wrong with the Eyoyo 5-700 Yard Rangefinder. ​The Double Eagles Depro-600 Rangefinder is on the higher end of the budget rangefinders, but is an overall low to middle-tier laser rangefinder. The red-and-black design is made with a rainproof rubber cover for additional grip and shock protection, making it very durable. We chose this model because it is the perfect price range between budget and mid-tier, with features that fall into both categories. 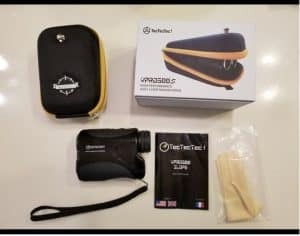 The Double Eagles Depro-600 Rangefinder is a rainproof and highly portable rangefinder at just 4.2” by 2.8” by 1.6” with an effective range of 600 yards. It is accurate up to 1 yard from perfection, and when combined with the pin mode, smart Pin-Sensor technology, and 6x magnification, finding the pin has never been easier. It can also scan around your target, identifying any hazards while ignoring background objects that are too far away. Included with your purchase are a carrying bag and strap to make it easier to carry around as well as an extra battery and cleaning cloth to keep it up and running. Unfortunately, despite being more expensive, this rangefinder isn’t the budget option with slope support. The second negative about it is the price, because it has fewer features than the previous budget option and similarly priced options as well. It also cannot track speed and requires a CR2 battery. You can only get this product here. You ​will not be able to find directly on Amazon. ​​​The Double Eagles Depro-600 Rangefinder has many of the standard features that are shared by the rangefinders on this list. It is stylish, highly accurate, and incredibly portable, making it a good choice for a beginner who won’t miss some of the features it doesn’t have. ​While you may not have heard of Boblov, you’ll be glad you did now. What they lack in advertising, they make up for it with quality gear without name brand prices. They sell affordable outdoor gear for hunters, campers, skiers, and golfers. 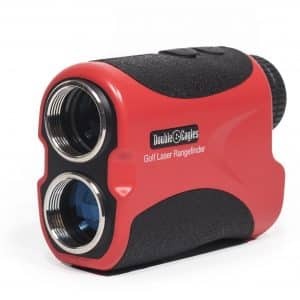 Their 650-yard budget golf laser rangefinder certainly doesn’t look or feel budget, with a clean black and white finish to help you look like a pro without blowing the bank. We chose this model because it has one of the best price-per-yard ratios of any laser rangefinder on the market. It is priced as an entry model but can benefit players of any caliber with a long effective range and a variety of extras. If you’re looking for your first rangefinder or want a laser model to go with your GPS rangefinder, this may be the choice for you. 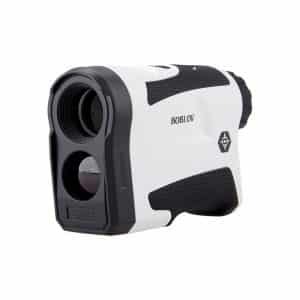 The Boblov 650-Yard Golf Rangefinder is a laser rangefinder that is approved for tournament use by the USGA. It is primarily used for golf, but also works for various outdoor activities like horse racing. At just 4.6” by 3” by 1.6”, it is small enough to easily fit in your golf bag or pocket for easy use. The measuring method it uses is a high-powered laser, so to use it you will have to aim and point at your target to receive the distance. It has an effective range of up to 650 yards with an accuracy of 1-2 yards depending on the distance from the target. This is longer than most holes in the world, making it useful no matter where you play. In addition to measuring the distance of your target, the viewport also has 6x magnification to make targeting easier and has modes for measuring the speed of your target and Pin-Sensor flag-locking technology to make sure you’re always on target. This model is a budget product, which means that it doesn’t have every bell and whistle available. However, it still offers a ton for its price. One of the extras it has is a vibration function to let you know when you’re locked on a target. This way you can be sure that you’re aiming at the right spot. It also has a rechargeable battery that can be charged via USB cable, saving you from needing to carry batteries with you. Finally, the product comes with a stylish carrying bag and a cleaning cloth to make sure you can find your target even if it gets smudged. Where this model primarily falls a bit short is in the function. It lacks the ability to identify and account for slope, which you will find in more deluxe rangefinders in higher price ranges. This feature can be incredibly useful for getting a favorable roll on the green. The carrying bag could also be improved by turning it into a case that is weather or shock-proof. Right now, it simply protects it from scratches, which leaves it open to being dropped or rained on. This is an even bigger flaw when you add in that the rangefinder is not weather-proof, and Boblov does not list any warranty on their listings. If you drop it in a puddle or on the ground, you may be out of luck. ​​​​Where this pick would excel would be for those are looking for an entry-level rangefinder that is affordable but incredibly accurate. The price point and effective range are its primary benefits, so casual players who don’t need slope readings and who can protect it from damage would definitely benefit from this product. ​The Bushnell Pro X2 Golf Laser Rangefinder may just be the best rangefinder on the market. With multiple “best of 2018” awards, Bushnell’s pride and joy has got it all. It has nearly unmatched range, laser-precise accuracy, and a ton of extras to make it even better. Despite being the most kitted-out rangefinder on the market, it still very easily fits in your hand and can be carried around without a problem. We chose this model because in our opinion it is the very best luxury golf rangefinder on the market. If you can stomach the price, the Bushnell Pro X2 Golf Laser Rangefinder can do almost no wrong. The Bushnell Pro X2 Golf Laser Rangefinder is one incredibly powerful and stylish laser-powered device. Powered by a CR-2 lithium battery, the class 1 laser has an effective range of up to 1300 yards, or about 2-4 holes of golf. To be able to see this far effectively, you will need to use the 6x magnification, which allows you to find hazards or the pin from far away quickly. If you’re having trouble seeing the display, you can toggle a vivid red or sharp black display with a flip of the dual display switch. ​​It is a feature exclusive to Pro X2 which allows the user to ​toggle between a bright red vivid display ​or sharp black display ​by merely pressing the Mode button in the device. This feature is provided for the user preference based on the lighting condition available. With its Pin-seeker technology, the X2 is able to lock onto a pin from more than 450 yards away without a problem, and even further with some additional targeting. Once you’re locked on, the JOLT technology will make the device vibrate and give you the measurement accurate to a half-yard so that you can choose a club with confidence. It can even take advantage of Bushnell’s patented toggle-able slope technology to give you a slope-adjusted measurement, so you know how long to play the shot. If you’re playing tournaments, turning it off is as easy as pushing a switch up. The perks don’t stop quite yet. The Bushnell Pro X2 Golf Laser Rangefinder includes a carrying case to protect it from weather and for easier use. This rangefinder is also entirely waterproof, so regardless of the weather (or the water you spilled in your bag), your Pro X2 will keep on kicking. Finally, you can stop holding your breath when using it because it comes with a 2-year warranty in case it breaks on its own. Just don’t drop it too hard. In terms of improvements, there really isn’t much to nitpick. The battery not being rechargeable is inconvenient, with CR-2 lithium batteries being slightly expensive and hard to find locally. It also cannot measure speed, meaning you can’t bring it to the race track. However, the primary objection you could have for the Bushnell Pro X2 is the price, by far the most expensive product we’ve reviewed. ​This product is best for someone with a higher budget who is looking for a useful laser rangefinder​. It comes with solid extras like a protective carrying case and extended warranty, but doesn’t read ​speed information and can be a pain to get batteries for. Price aside, it is one of the most effective Bushnell's laser ​rangefinders in golf available at present. If you’re looking for a high-quality and compact rangefinder with incredible range, the Bushnell Tour V4 is just that. Bushnell is one of the market leaders when it comes to rangefinders, and they offer a variety of products including GPS rangefinders on their website. The Bushnell Tour V4 JOLT Golf Laser Rangefinder is proof that great things can come in small packages. It is a deluxe rangefinder with a price to match the power it comes with. Despite packing one of the longest effective ranges available, it is also smaller than many other options. We chose this model because it is a luxury product for the most serious of players, or those with deep pockets but an eye for quality. 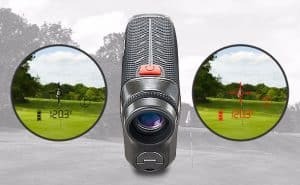 The Bushnell Tour V4 JOLT Golf Laser Rangefinder is a stylish and incredibly powerful laser rangefinder approved by the USGA for tournament use. To add to the portability, it comes with a zippered hard carrying case to protect it from drops and to make it easy to carry on you or in your bag. Just in case something does happen, a 2-year warranty from Bushnell covers you. Where this model sets itself apart is in the effective range of the laser. With a range of up to 1000 yards and up to a ± 1 yard margin of error, you can be sure that you can target and hit any pin in your line of sight. For the really far targets, you can also use the 5x magnification and fast-focus system to make it easier to locate them. 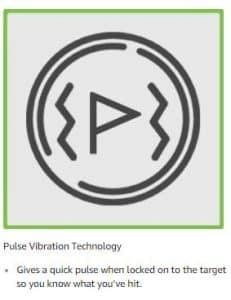 Once you do, use the Pin-Seeker feature to track the pin and when you feel a vibration, that is the JOLT system telling you it is locked on. This way you can be sure that you’ve selected the right target to measure. Despite being priced like it has everything, the Bushnell Tour V4 JOLT Golf Laser Rangefinder still falls a bit short in features. Even with the price tag it comes with, the model does not come with slope support. While this makes it simpler to use for tournaments, it limits the information you can use for your shots. It also cannot track speed for targets, which is available in a few other products listed. Lastly, it is powered by CR-2 lithium batteries which can cost you a bit more, and doesn’t allow you to recharge it yourself through a USB port. If the battery were rechargeable, it would be much more convenient and even cheaper to use. 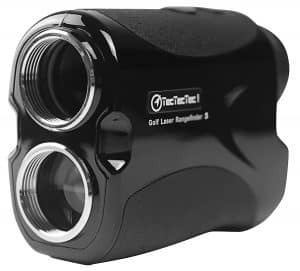 ​This product is best for someone with a higher budget who is looking for a ​best golf laser rangefinder in the mid-range price tier. It comes with solid extras like a protective carrying case and extended warranty, but doesn’t provide slope or speed information and can be a pain to get batteries for. 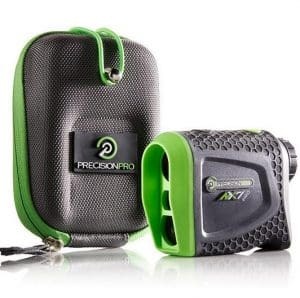 Price aside, it is one of the most effective laser golf rangefinders available. ​If you recognise the name, it’s because this is the second Tour V4 we’re reviewing. The Shift model is similar to its counterpart, with the key distinction that it includes slope-switch technology to account for inclines or declines on the course. We chose this model because it comes at a significant discount from the X2 ($350) while offering similar features, and makes up for the non-Shift model’s primary negative; a lack of slope support. The Bushnell Tour V4 Shift Golf Laser Rangefinder is a class 1 laser powered rangefinder that runs on CR-2 batteries. The laser offers more than enough effective range for any hole you can find with a range up to 1,000 yards with up to a 1-yard margin of error, and can use PinSeeker to lock onto any flag 400 yards away. To find the flag, you can use the 5x magnification with fast focus and the JOLT technology to let you know when you’re locked in. The Shift model can also account for slope, giving you adjusted measurements based on the angle of the surface you’re measuring. This could be the difference between a 20-footer or a tap-in, especially on uneven terrain. If you’re playing in a tournament, you can toggle slope measurements off to follow USGA rules, making it USGA approved. Like the other V4 model, this also comes with a high-quality zipper-sealed carrying case to protect it from scrapes and damage. As always, Bushnell supports their products with a 2-year warranty if things go wrong. While this model has improved on its counterpart’s lack of slope support, it still shares the same additional problems. The model is not waterproof, making it dangerous to use in the rain or near water hazards. It also can’t measure speed and doesn’t have a rechargeable battery, which is inconvenient but not a deal breaker for a golf rangefinder. Finally, it is an expensive rangefinder, coming in below the X2. 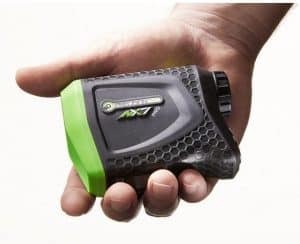 ​The Bushnell Tour V4 Shift Golf Laser Rangefinder is for those who are looking for as much information as possible within a 1,000-yard range. In terms of luxury rangefinders with slope support, the Pro X2 and the V4 Tour Shift models are likely going to be your choices. They offer similar features, with the X2 offering additional effective range and accuracy while being waterproof. However, at about 30% more than the V4 Tour Shift, it may be better for those on a budget to go with the V4 Tour Shift as long as they avoid the water. Although it wasn’t created for golf, this hunting rangefinder can still get the job done. 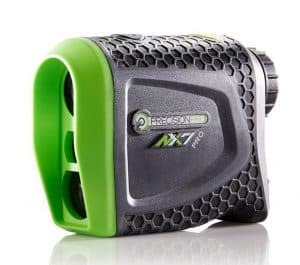 This camo-clad laser rangefinder is priced similarly to the Bushnell Tour V4; however, its features are tailored more towards hunting than golf. While it lacks some of the specific features we’ve come to expect thus far, it has the range to match the Pro X2 for nearly half the price. We chose this model because it has an incredibly effective range for its price, as well as higher accuracy than some of the other models. ​Should you consider this bad boy​? 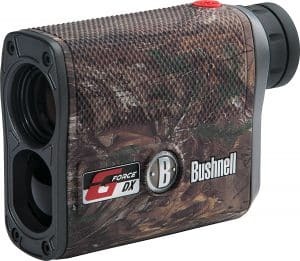 If this were a hunting rangefinder review, the Bushnell G-Force DX ARC Laser Rangefinder would probably be towards the top. It has an effective range of up to 1,300 yards – matching the Pro X2 and also with the same accuracy (± ½ yard). However, it is nearly half the price of the X2, making the choice between the two models harder. This model comes with vivid display technology that can magnify up to 6x to make the measurements easier to see regardless of the environment as well as a Bushnell’s patented rain guard lens treatment to keep it from fogging. The rangefinder is also waterproof, making it a great choice for those wet days on the course. 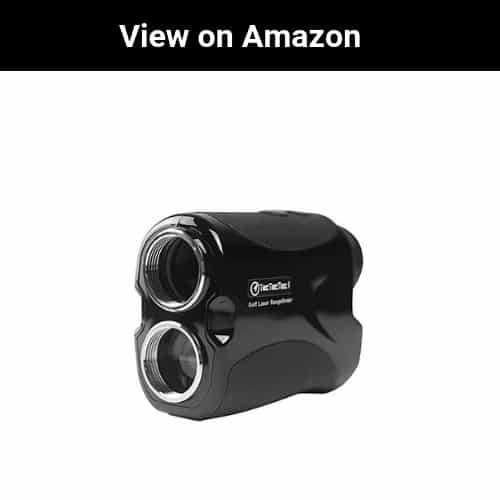 Unfortunately, because this is primarily a hunting rangefinder, there are some problems with it for golfing. First, it has no targeting system like Pin-Seeker to hone in on the pin for accurate shots, but instead has modes for filtering out brush from your target. It also has no slope support or JOLT technology, limiting the benefits it offers compared to the similarly priced Tour V4 models. If this rangefinder had been created for golf instead of hunting, it would likely be the best value on the review. However, it lacks features that make targeting on the golf course easier. If you’re looking for a multi-use rangefinder for all sorts of activities, this may be the product for you. If you plan to just use it for golf, you’re likely better off checking out a different model from above. ​But, still it gets our respect it deserves! ​Now that you’ve checked out 10 of our best golf rangefinders, it’s time to start considering which one would be best for your needs and budget. 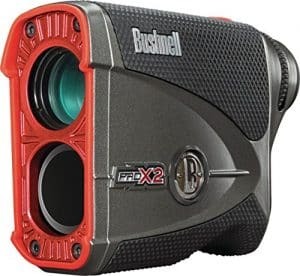 If you are looking for the very best golf range finder available regardless of price, you cannot go wrong with the Bushnell Pro X2 Golf Laser Rangefinder. This model has it all. It is tied for the highest effective range at 1,300 yards, has toggle-able slope-compensation to make it Compliant, has a view-port with 6x magnification and dual-display technology, and is even waterproof. It is hard to find a fault for the Pro X2 outside of price, so you can be confident that choosing it will be great for your game. If you are looking for the best possible golf rangefinder for the money, we would recommend the Callaway 300 Pro Laser Rangefinder. This model comes in at about half the X2. However, it comes pretty close in features. It has an effective range of up to 1,000 yards. It also has slope compensation, a 6x magnification, and scanning functionality to measure multiple targets at once. When compared to the other options available, the features, range, and price have the perfect balance to be beneficial to anyone who decides to pick one up. Now that you’ve got some recommendations of out best golf range finders, get yourself one and get out there and start improving your game. ​The freshly cut grass, the clear blue sky, and the sun beating down on your face. There’s not much better than playing 18 holes on a warm sunny day. Whether you’re out with friends having a good time or competing in a tournament, there’s nowhere a golfer would rather be. Even with the serenity that the course brings, nothing derails your afternoon more than ending up over par. Players go to incredible lengths to improve their game; buying the newest and most expensive clubs, getting a swing trainer, setting up a backyard green, and more. Unfortunately, no matter how much money you spend improving your swing or upgrading gear, there is still no guarantee that you’ll become the next Tiger. After all, if you could choose to use Tiger’s equipment or get lessons from him, which would you choose? Knowledge and information are likely to take you further than gear, and is as close to a guarantee for improvement you can get in golf. When you started golfing, you had to learn about clubs, swing mechanics, putting, and more. This knowledge helped you to become a better player, not your clubs. Therefore, any gear that helps you get more information to learn from and use are just as important – if not more important – than your club, gloves, or bag. This is where a golf rangefinder comes in. ​What is a Golf Rangefinder? ​A golf rangefinder is a handheld tool that allows you to better plan your approach to a hole. Using laser measurement or GPS calculation, it can determine how far anything on the course is from you. Distance is one of the most essential factors in golf; it affects your club use, swing power, swing type, and more. When you step up to the tee of a hole, you will most likely know the distance to the hole, the par, and a general idea of the layout. However, as you progress through the hole, you have less precise information available. It is especially true if you’re unfamiliar with the course, there are a lack of yard markers, or you have to account for hazards. For example, if you’re on stroke 2 of a par-4 and there are no distance indicators, you may struggle to pick a club for your next shot. If you’re on a dogleg and need to know how far you need to hit it to set up your second shot, you’re going to want to know the distance to your spot. Without a proper distance measurement, you risk under-shooting it and landing in the water. These are situations where a rangefinder can help elevate your game. 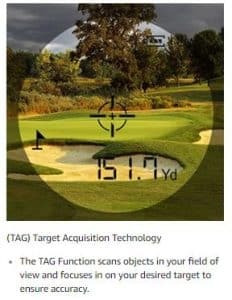 ​​How Does a Golf Range Finder Work? How a golf rangefinder works depends on the type of rangefinder it is. There are two types: GPS and laser-measuring rangefinders. While they both measure the distance between you and parts of the course, they do so differently. When using a laser rangefinder, you will be aiming at the target you want the distance too. If you are worried about it being able to distinguish where you are aiming, worry not. 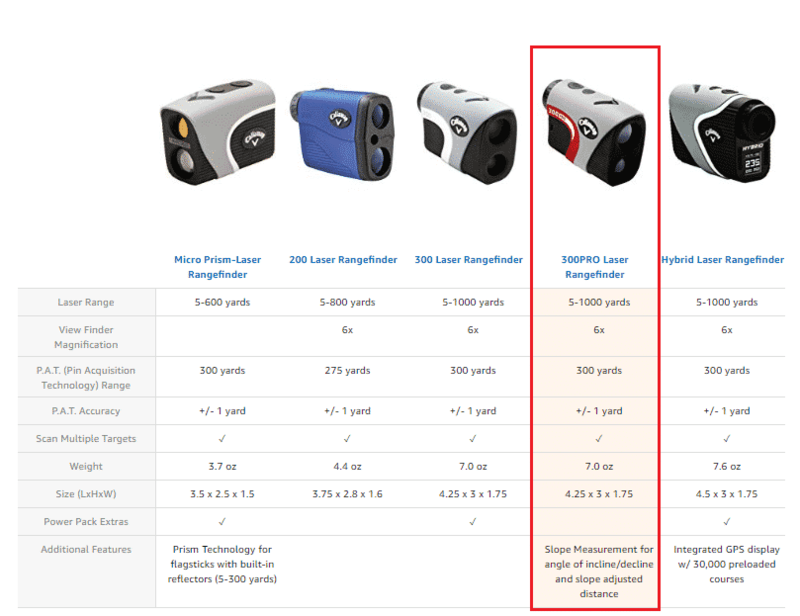 Many laser rangefinders come with technology that filters out the background (trees, sky, etc.) so that targeting is easier. This way you can be confident that the reading you receive is accurate. Looking through the view-port, you can target the pin, a hazard, or anything else you want. Pulling the trigger on the rangefinder will then send a laser at your target, measuring the time it takes for it to reach the target and bounce back. The laser travels at a specific speed, so the time it takes to reach the destination and come back tells you the distance and will be displayed on the view port. This way you can quickly point, click, and be done. A GPS rangefinder is a bit more complicated than a laser rangefinder. Instead of pointing and clicking at something, the rangefinder will use satellites to locate you using GPS and give you the distance to different elements on the course. They can also display topographical information such as slope or hazards you may not see from the tee. In order to receive this information, your course will need to be mapped and programmed into the device. Every course needs to be mapped manually before it can use satellites to provide relative distances, features, and more. ​Naturally, when there are two types of a product to choose from, people want to know which they should choose. As always, what is best for you will depend on your needs. A weekend player and a pro will have different needs and budgets, so there is no unanimous better choice. Here we will compare laser and GPS golf rangefinders based on a few critical metrics. You can decide how important each aspect is to you, helping you to select between choosing a laser or GPS device. Remember that each product is different, and some specific products may not share the same pros or cons of the average product of their type. For example, if a product is on sale, its price wouldn’t be a limiting factor. When you’re trying to gauge the distance between you and the pin, you want to be able to do it quickly so that you don’t hold up play. Both a GPS and laser unit can be carried in your bag or worn on your person to be taken out when needed. They are equally convenient to use on the course, with a slight edge to GPS models that come as watches for extremely fast use. When it comes to any kind of technology, easier is often better for most people. With a laser rangefinder, it couldn’t be easier to setup and use. All you have to do it point at a target, pull the trigger, and you’ll get the distance to it. With a GPS rangefinder, your course will need to be mapped beforehand and downloaded to the device to receive the information. Navigating the map can be hard for some users, giving a substantial edge to laser rangefinders. A rangefinder is useless if you can’t get distance or information from it! To receive a distance reading from a laser unit, the laser that is sent out needs to bounce off the target and return to the device. However, if there is exceptional fog, the laser is too weak, or the target isn’t reflecting the laser, you cannot receive an accurate reading. Similarly, a GPS unit needs a satellite signal in order to track your location on the course. Without it, you cannot get updated distances. With a high-quality laser, you are not likely to run into many problems with visibility. However, golf courses can sometimes be covered by trees or outside of strong signal areas, causing it to be harder to maintain a satellite signal. Because of this, a laser system is likely more reliable. As stated previously, the more information you have the better you can be as a player. With a laser golf rangefinder, you are primarily limited to the distance to an object or elevation changes (available on some models). You also need to be able to see your target to get a distance. With a GPS golf rangefinder, once you load the map of the course, you can see everything from a bird’s eye view. Distance, hazards, topography, and more are available without needing a line of sight to them. If you can maintain a signal, a GPS system will provide more information than a laser. In a game where a few yards can be the difference between dunking a ball in the water or hitting the green, precision is incredibly essential. A GPS system needs to use a satellite signal to give distances, which can only be so accurate given it tracks you from space! They will usually be correct within a 1-3 yard margin of error. A laser system, however, can be more accurate because you are closer. If you mark the target correctly, you will likely receive an accurate distance up to a few feet off. This heavily favours the laser, as precision is one of the most critical parts of golf. In the end, it seems like everything comes down to money. The price you can expect to pay for either type of rangefinder will vary on the brand, quality, and a variety of other factors. For a laser system, you will end up paying more for models with a longer effective range, more accurate readings, and additional features like slope reading, speed reading, and more. For a GPS system, you will pay more for larger displays, longer battery life, watches and other portable designs, and extra features like a voice to read information. The prices you can expect depend on far too many factors for one to be superior. The best way to determine which is a better value is to look for sales. As you can tell from the information above, there is no de facto superior choice between a laser or GPS rangefinder. A laser model is more accurate and easier to use, but gives less information than a GPS model. They are similar in price, reliability, and convenience, bringing the decision down to a case-by-case basis. ​​Is a Rangefinder for Me? One of the great things about golf is that you control how you play. No matter your skill level, you can take to the links and have a great time; golf doesn’t have to be taken seriously. You can also live and breathe golf. A casual golfer can be more than happy with a good set of clubs and a bag that doesn’t hurt to carry. However, someone who takes it seriously may need a club for every situation, special gear, and their lucky hat to play their best. A rangefinder is an optional piece of gear just like a bag or gloves. It can help you to improve your game by providing more information than you can’t easily get without it, but will not make your swing consistent or you hit the ball harder. This makes it hard to quantify how useful a rangefinder can be for a player, making them question if they need it or not. The answer? It depends. A rangefinder is likely to cost you between $100 and $300, depending on the type and model. This is a steep price to consider for something that won’t make you a pro or impress your friends. Instead it will help you to make better decisions on the course, learn faster, and refine your target accuracy. This is valuable information and there is no negative to a rangefinder, but not everyone can take advantage of the benefits to justify the price. If you’re a player who sends more than 30% of your shots into the rough or hazards, you’re probably not at the point where you would benefit from the added precision a rangefinder provides. Instead, you may benefit from training gear like a swing trainer to improve your consistency. Once you find your stroke, you can worry about the few yards you’re away from the hole. However, if you want to begin developing a sense for the game, familiarizing yourself with local courses, and making better shots now, a rangefinder definitely won’t hurt. If you find yourself hitting your target often but are struggling to choose a club or your swing power, you would likely benefit from the rangefinder. It will help you to learn how far you hit your clubs, add precision to your targeting, and give you more information to approach each shot with. With a GPS rangefinder, you can also confidently navigate any course, even if you’ve never been there before. Just make sure you download it beforehand. ​Why Should I Use a Rangefinder In Golf? A few yards here, a few yards there. When you’re a few yards off in your distance estimate and your club distance is inconsistent, it is easy to over or undershoots it. With a rangefinder, you can measure where your shots end up and see what your range is for each club so that you know which to choose. There’s a reason that pro golfers have practice rounds before tournaments. Knowing what to expect from a hole can entirely change your approach. With a GPS rangefinder, you can easily map out each hole so that you make the right shot every time. Always Choose the Right Club – If you need a 7 iron, but you’re hitting a 9 iron, you’re going to have a bad time. 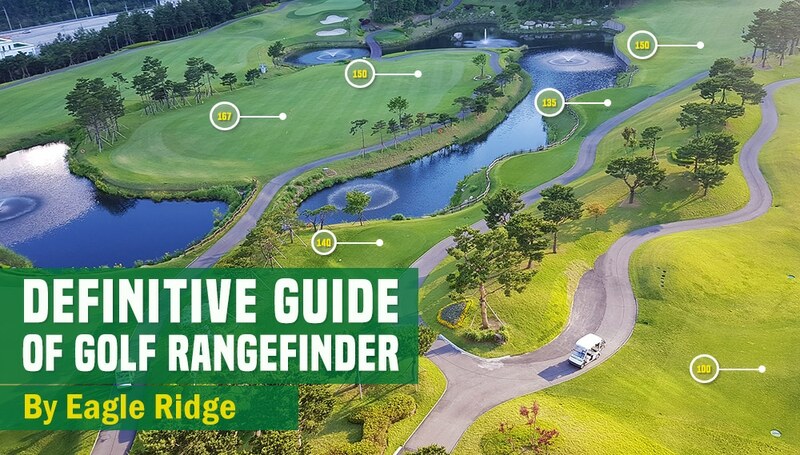 Using a rangefinder to find your club ranges allows you to be sure that you’re choosing the right club based on the distance the device gives you. No more sand traps or water hazards. Let’s be real; everyone loves golf until things go south. One or two bad shots or bad decisions can kill your confidence. You play best when you’re confident, and with a rangefinder, you’re going to have less mistakes, take fewer strokes, and improve your scores to boost confidence. If you’ve ever looked around for a yard marker, chances are your partners weren’t too happy. You don’t need to pace out the distance your ball sits from the yard marker, you can simply pull out your rangefinder to see how far you need to hit it. Within 30 seconds, you’ve calculated the distance, chose the right club, and sent the ball towards the flag. Whether you’re a rookie or a pro, everyone can benefit from the perks of a rangefinder. It's the second-best thing after having your own caddy, and even they use a rangefinder to map the course before a tournament! 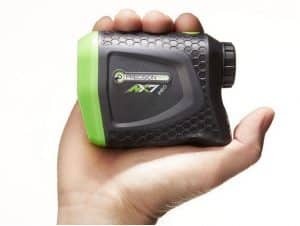 ​What to Look for in a Golf Rangefinder? Now that you’ve (hopefully) decided that you want to get yourself a golf rangefinder, the true decision-making process begins. While every rangefinder will help you calculate distances, there are a variety of details that can separate the different choices. Do you want to go all-out and get the very best? Do you want one that you can wear as a watch rather than carrying around? The choice is yours. Below are some of the things to consider when you’re browsing through golf rangefinders. The first and most important choice to make. The type of rangefinder you choose will effectively cut your choices in half, and will determine which of the other features apply to your decision. You can choose between a laser or GPS model, and their benefits are listed above. The more accurate, the better. Accuracy is how precise the rangefinder is in its measurements. As a general rule, a laser device is more accurate than a GPS device. Usually, a laser rangefinder will be accurate within 1 yard of the estimate, while a GPS rangefinder will be within 1-3 yards on average. Half the reason for using a rangefinder is the convenience of not having to pace distances or track yard markers. Portability measures how easy the device is to carry around with you. GPS rangefinders can come in handheld systems or as a watch for added convenience, while a laser is primarily carried in the bag or attached by a clip. You need your golf rangefinder to last for the full 18 holes. Be sure that you choose a device that can last at least 8 hours so that it doesn’t die while you’re out there. Some devices can even last for more than 2 rounds of 18 holes for marathon sessions. For longer courses, it helps to be able to measure longer distances. Maximum range only applies to laser systems, and refers to the maximum distance that the laser can travel to measure how far the target is. Many laser golf rangefinders have at least a 400-yard range, with some reaching as far as 1,000 yards. Elevation and the orientation of the green can profoundly affect how a hole plays. A laser device with slope support is able to identify and account for the difference in the distance recommendation. Both laser and GPS devices have extras that can be included. For lasers, be on the lookout for additional modes that allow you to track speed, lock onto a flag, or magnify through the viewport. For GPS devices, you can find extras on the display like shot distance, score keeping, an overview of hazards, and even a voice feature. Obviously, you want to save as much as possible, but to get the extra features, you may have to pay a bit more. You can expect to pay between $100-$350 for a golf rangefinder. The United States Golf Association doesn’t permit the use of rangefinders except for distance measuring. 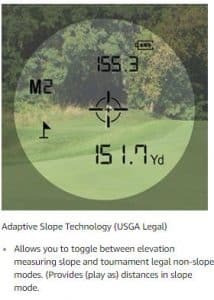 Any additional features like slope measuring or topographical features need to be disabled or nonexistent for the device to be USGA approved. Fortunately, if you don’t plan to compete, you don’t have to worry. In the end, the decision of whether or not to buy a rangefinder comes down to your approach to golf. If you play for fun and don’t care too much about your scores, the few hundred dollars may not be worth it to you. If you’re playing seriously and always looking to improve, you absolutely need a rangefinder so that you can learn and improve more quickly. However, there is no negative to using a rangefinder as long as you know how to work it, so players of all levels should at least consider picking up a cheaper model or borrowing someone’s to try it out if they’re unsure. You could even get one of each, that way you can get precise measurements of a laser golf rangefinder and the bird’s eye view that a GPS golf rangefinder offers. The more information, the better!